PAVIGYM™ are determined to bring the Ultimate Fitness Experience to fitness users of ALL ages, body types and levels, by using a combination of the best performance flooring, interactive technology, inspiring designs, and ready-to-use programming. They look for and apply creative solutions to our client’s problems. They like to experiment, detect new needs, and create products that improve the well-being and quality of people’s lives. Avoid Marks on the floor. Its high resistance makes PAVIGYM MOTION the only Group-X flooring able to resist marks from dropped weights and accessories. Friction specially designed for Group-X. PAVIGYM MOTION’s optimized friction allows all types of choreographed classes to be practiced, avoiding incidences of slipping or blocking. Reduce Injuries, PAVIGYM MOTION’s impact absorption and point elastic properties are specifically designed for top performance. PAVIGYM MOTION provides excellent comfort and reduces risk of injuries caused by rigid and aeroelastic flooring. 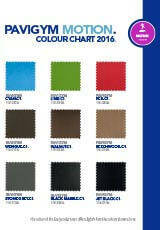 In addition, PAVIGYM MOTION is Easy to Install: Loose-laid, no need to Glue, with all the cost savings which that implies. 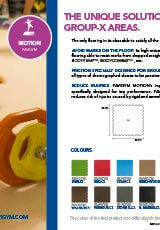 Inspire your gym members through the design of your Group-X Areas with PAVIGYM MOTION, available in 7 standard colours.